IT has been portrayed as a fight between Justice Minister David Ford and `fat cat’ lawyers, who have selfishly raked in millions of pounds from lucrative Legal Aid payments at the expense of the man in the street. But is the legal aid dispute simply about lawyers having to accept their fair share of the public spending cuts or is there another motive: for local lawyers to be brought into line? One of Northern Ireland’s most senior barristers, Eugene Grant QC, has spoken out publicly to insist that Mr Ford’s cuts to the Legal Aid budget has little to do with financial savings but is instead aimed at neutralising local defence lawyers. With 37 years experience at the Bar, Mr Grant QC is one of the north’s best known barristers. He was a member of the Criminal Justice Review which drew up the blueprint for reform of Northern Ireland’s legal system back in 1999. “Despite the headlines, this dispute is not about money – it is about the survival of an independent system of justice available to the general public equally regardless of currency, class or creed. Some defence lawyers believe that the decision to cut the legal aid budget is a deliberate attempt to dumb down the effectiveness of defence lawyers following the Public Prosecution Service’s failure to secure convictions in a number of high profile trials in recent years. They also claim that the Northern Ireland Courts Service (NICS) decision to publish league tables setting out Legal Aid payments to individual lawyers is less to do with transparency and more an aggressive PR tactic to strip solicitors and barristers of any public support in the ongoing row. One league table published this week showed that 200 lawyers and barristers were paid £70m in Legal Aid last year. The Justice Minister says these payments are not sustainable but lawyers say there is no equivalent campaign over spending in the PPS, which in 2007 was criticised for a wage bill five times higher than their counterparts in England. They claim Mr Ford’s real intention is to radically restructure how justice is dispensed in Northern Ireland; and the outcome will be a weaker defence for those in the dock – and a greater likelihood of miscarriages of justice. One possibility is a new American-style public defender system. Another they fear is a duplication of reforms in England and Wales which is seeing Legal Aid work consolidated into a series of big firms while other small independent defence practitioners abandon Legal Aid cases because they aren’t financially affordable. Earlier this year Pearse McDermott of the Solicitor’s Criminal Bar Association told the Stormont Assembly’s Justice Committee: “The prosecution would have whatever funds are available to it through the PPS, the Police Service and the forensic science agency, but the defence would be substantially underfunded. In an interview with the “The Detail” Justice Minister David Ford refused to rule out some form of public defender system for Northern Ireland as part of the options he is considering if lawyers refuse to sign up to the new system. Q: “Is this moving towards the public defenders system where you are providing the defendant with a public defender? “Hold on, Legal Aid already pays the defence, you know. “I’m not sure that there’s any, you know, philosophical difference between a solicitor in private practice paid from the Legal Aid budget from the public purse and somebody employed directly as a defendant’s representative. This latest showdown between the legal profession and the public authorities has been marked by a complete breakdown of trust on the part of lawyers. Since 2009 the Law Society, (representing solicitors) and Bar Council (representing barristers) have been engaged in a series of negotiations with the Northern Ireland Court Service (NICS) in an attempt to reduce the north’s £100m Legal Aid budget. All agreed that the budget, which currently stands at £104m, was unsustainable. 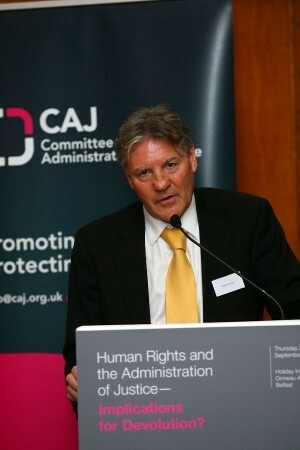 As part of the talks surrounding the devolution of justice powers to Northern Ireland in 2009, the then Prime Minister Gordon Brown agreed a financial package for Legal Aid with First Minister Peter Robinson and Deputy First Minister Martin McGuinness. The funding was deliberately ring-fenced for four years to ensure the transition of justice powers. As part of the package, representatives of the respective lawyers and barristers associations met with NICS officials to agree a series of cuts in the legal aid budget, totaling £25m. The proposals included the abolition of Very High Cost Criminal Cases (VHCCCs), the abolition of exceptional Crown Court cases and solicitors taking a 25% cut in standard fees while barristers took a 20% cut in fees. In a profession which is so well versed in negotiations, it should have been a done deal. But in the six months since the apparent agreement was finalised in December 2010 the relationship between lawyers and the Justice Department has broken down irrevocably. Lawyers accused the court service of “bad faith” after it emerged that NICS had unexpectedly decided to cut an additional £4m from the agreed new £79m budget, despite the money having been previously guaranteed by Gordon Brown. “We didn’t renege on any deal. “It’s the duty of the Department of Justice to make the regulations. “We engaged in lengthy discussions with the Bar Council and with the Law Society. “There are a number of options and I’m not stating specifically what we are doing other than we are looking to see what the options are in order (that) we see the justice system is maintained. “You talk about people flying in from England, we have seen plenty of that in recent years where barristers have flown in from England to carry out cases in Northern Ireland courts. “They obviously find it acceptable on the basis of the Legal Aid rates in Northern Ireland being better than the rates in England. The two sides are expected to meet for talks this week.